Applications Developer at ThoughtWorks, Inc.
Anastasia Belozertseva grew up in Moscow, Russia until moving to the United States at the age of 14. In 2008, she matriculated at the University of Chicago where she studied Physics and Economics. At the end of her second year, she joined a research group under the supervision of Professor Young-Kee Kim. She was involved with the international Muon Ionization Cooling Experiement (MICE) at the Rutherford Laboratory in the UK, which aimed to demonstrate the feasibility of ionization cooling of muons, which, in turn, would help overcome the technical challenges of constructing a muon collider. 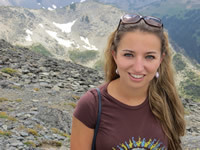 With an undergraduate thesis based on the work done with MICE, Anastasia graduated in 2012 with a degree in Physics with Honors and Economics. In July of 2012, Anastasia joined ThoughtWorks, Inc, a transnational IT consulting firm as an Applications Developer. ThoughtWorks is a transnational IT consulting firm dedicated to being at the forefront of innovation, delivering groundbreaking software as well as promoting positive social change. Over the last year and a half, Anastasia has worked on two projects: a mobile application for an educational start-up in New York as well as a web project in Austin.